Human tumour necrosis factor (TNF)-like weak inducer of apoptosis (hTWEAK) and two anti-hTWEAK mAbs were tested for their ability to elicit or block inflammatory responses in cultured human dermal fibroblasts and synoviocytes. Incubation with hTWEAK increased the production of prostaglandin E2, matrix metalloproteinase-1 (MMP-1), IL-6, and the chemokines IL-8, RANTES (regulated on activation, normal T expressed and secreted) and interferon-γ-inducible protein-10 (IP-10) in culture supernatant of fibroblasts and synoviocytes. In combination with TNF or IL-1β, hTWEAK further stimulated the secretion of prostaglandin E2, MMP-1, IL-6 and IL-8 up to fourfold, and IP-10 and RANTES up to 70-fold compared to TNF or IL-1β alone. An anti-hTWEAK mAb, BCB10, blocked the effects of hTWEAK, whereas hTWEAK crosslinked by the anti-hTWEAK mAb, BEB3, further stimulated the inflammatory response of fibroblasts and synoviocytes. The anti-hTWEAK mAbs were ineffective in blocking or increasing the responses of TNF or IL-1β and blocking anti-TNF mAb was ineffective in preventing the responses to TWEAK. These results were also confirmed at the RNA level for MMP-1, macrophage chemoattractant protein-1, RANTES, macrophage inflammatory protein-1α, IP-10 and IL-8. TWEAK in synergism with IL-1 and TNF may be an additional cytokine that plays a role in destructive chronic arthritic diseases. Interleukin-1 (IL-1) and tumour necrosis factor (TNF), mainly produced by macrophages, are among the principal cytokines occurring in acute and chronic inflammatory diseases. They act on a large number of target cells by inducing, for instance, the expression of cytokines, chemokines, cytokine receptors, prostanoids, adhesion molecules and matrix metalloproteinases (MMPs). Under the control of T cells and macrophages, synoviocytes contribute to the destructive inflammatory process of the articular structures in chronic arthritic diseases [1,2,3,4]. This type of cellular interaction is not only mediated by soluble factors but also by direct contact between stimulated T cells, inducing macrophages to produce large amounts of TNF and IL-1 [5,6]. These cytokines induce the production of MMP-1, MMP-3 and inflammatory molecules such as prostaglandin E2 (PGE2), leading to the degradation of the extracellular matrix and the resorption of the mineral phase of the bone [1,2,3,4]. In addition, IL-1 and TNF induce the production of IL-6 and chemokines (e.g. IL-8, macrophage chemoattractant protein-1 [MCP-1]); IL-6 is mainly involved in activating B cells and MCP-1 is involved in recruiting inflammatory cells [7,8]. Three lines of results point to TNF and IL-1 as principal players in rheumatoid arthritis and probably also in other chronic inflammatory diseases. Studies have shown that patients suffering from joint inflammation have higher serum and/or synovial levels of TNF and IL-1 [3,4,7,9]. Another group has reported that transgenic mice secreting large amounts of TNF develop arthritis and joint destruction . Furthermore, natural inhibitors of TNF and IL-1 that are soluble receptors or antagonists (i.e. TNFsR, IL-1sRII and IL-1Ra) [11,12,13] and blocking antibodies to TNF and IL-1 are able to limit joint inflammation, pain and bone erosion in patients with rheumatoid arthritis [3,14,15,16]. Despite impressive clinical results with anti-TNF therapy, however, not all patients respond to such treatment and, in many, joint destruction continues to progress [17,18]. This could imply that other cytokines, in particular members of the TNF family, may play an additional role. TNF-like weak inducer of apoptosis (TWEAK) is another member of the TNF superfamily which currently includes more than 15 proteins involved in inflammation, cell differentiation, cell death and immune organ formation . It is a secreted protein with cytotoxic and proinflammatory activities [20,21,22,23,24,25]. TWEAK was also shown to act as a growth factor by inducing the proliferation of endothelial cells . As is the case for the other members of the TNF family [27,28,29,30,31], the active form of TWEAK is a trimer . In this study, recombinant, soluble TWEAK and anti-TWEAK mAbs were tested for their ability to induce or block proinflammatory responses in human dermal fibroblasts and synoviocytes. To isolate human dermal fibroblasts and synoviocytes, respectively, foreskin of normal donors and surgical specimens from patients with rheumatoid arthritis and advanced osteoarthritis were subjected to protease treatment as already described [1,2,6]. Synoviocytes were used from the third to the ninth passage. The cells were cultured in Dulbecco's modified Eagle's medium (Life Technologies, Paisley, UK) supplemented with 10% FCS (Seromed/Biochrom KG, Berlin, Germany), 50 μg/ml streptomycin, 50 IU/ml penicillin and 2 mM L-glutamine, at 37°C in 5% CO2. The cells were seeded at 2 × 104 cells/well into 96- well flat-bottom plates (Costar, Acton, MA, USA) and maintained for 48 hours before testing. Fresh medium (200 μl) either alone or together with cytokines and/or antibodies was then added for 72 hours, in the presence of 2 μg/ml of polymyxin B (Sigma, St Louis, MO, USA). The conditioned media were collected and stored at -20°C until further analysis. For blockade experiments, antibodies were preincubated in Eppendorf tubes at a final concentration of 10-7 M with cytokines or medium alone for 30 min at 37°C, and 200 μl of the mixtures were then added to the cells. For mRNA experiments, 2 × 106 cells were plated in culture plates (Falcon, Becton Dickinson, Heidelberg, Germany) in the absence or presence of cytokines and/or antibodies in a total volume of 5 ml of medium containing 2 μg/ml of polymyxin B for the indicated time. TNF and IL-1β were from Biogen (Cambridge, MA, USA). Recombinant soluble human TWEAK contains an NH2-terminal myc tag followed by amino acid residues Ala106–His249 of hTWEAK (GenBank accession # AF030099). hTWEAK was expressed by the yeast Pichia pastoris (Invitrogen, Groningen, The Netherlands) and purified by conventional methods. Monoclonal antibody to human TNF (D2E7, LU 200134) was from Knoll (BASF Pharma, Ludwigshafen, Germany). Hamster monoclonal antibodies to hTWEAK were prepared using conventional methods by injecting Armenian hamsters intraperitoneally with recombinant soluble hTWEAK in complete Freund adjuvant, followed by intraperitoneal booster in incomplete Freund adjuvant. Initial screening of mAb activity was carried out by ELISA: purified hTWEAK was coated onto 96-well plates and various hamster mAbs were tested for their ability to bind to this immobilized protein. The capture of hamster mAb was visualized using donkey anti-hamster IgG (Jackson ImmunoResearch, West Grove, PA, USA) labelled with horseradish peroxidase. Monoclonal antibodies were further tested to determine whether they were able to block hTWEAK-flag binding to HT29 cells. Total RNA was isolated from cultured cells using TRIzol reagent (Life Technologies, Paisley, UK) according to supplier's instructions. RNA was electrophoresed in 1% formaldehyde agarose gel, transferred to Hybond N nylon membrane (Amersham, UK) and hybridized to 32P-labeled MMP-1 (Dr Pierce, St Louis, MO, USA), cyclooxygenase 2 (COX-2) (a gift from Dr PE Poubelle, Ste-Foy, Canada) or glyceraldehyde-3 phosphate dehydrogenase (GAPDH) cDNA probes as already described by Rezzonico et al. . RNAse protection assay was performed with the human chemokine multi-probe template set hcK5 from Pharmingen (San Diego, CA, USA) as described by the manufacturer. Human IL-8 and RANTES were measured by ELISA using the quantikine immunoassay (R&D, Minneapolis, MN, USA). Human IL-6 ELISA was performed with innotest hIL-6 from Innogenetics (Zwijhaarde, Belgium). PGE2 was quantitized using the products and protocol from Neupert et al. . The determination of interstitial collagenase (MMP-1) was carried out as described by Lacraz and colleagues . Human IP-10 was measured using Hbt ELISA (HyCult Biotechnology, Uden, The Netherlands). 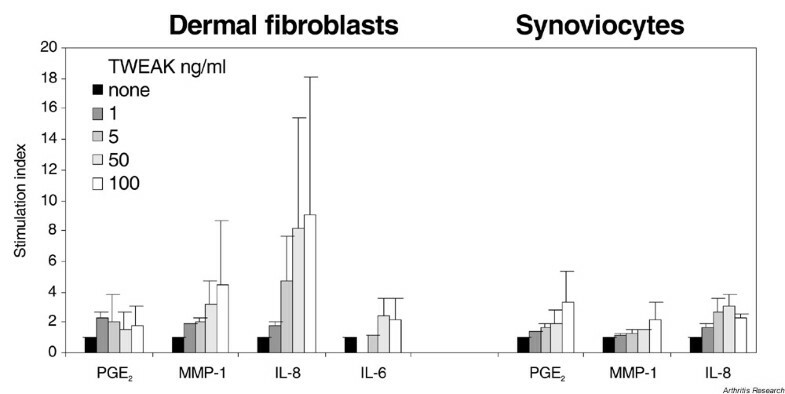 When dermal fibroblasts and synoviocytes were incubated with different concentrations of hTWEAK for 72 hours, PGE2, MMP-1 and IL-8 (and IL-6 to a small extent) were induced in a dose-dependent fashion (Fig. 1). These effects were observed in a series of similar experiments (10 on dermal fibroblasts and four on synoviocytes). As was to be expected with human pathological specimens, the basal levels and the increase in production were variable from one cell preparation to the other and differed in dermal fibroblasts and synoviocytes from different types of patients and diseases. Of note, tissue inhibitor of metalloproteinase-1 was not found to be modulated in TWEAK-stimulated dermal fibroblasts and synoviocytes (data not shown). Stimulation index of dose-dependent induction of IL-8, IL-6, matrix metalloproteinase-1 (MMP-1) and prostaglandin E2 (PGE2) by hTWEAK in 10 experiments on dermal fibroblasts and four experiments on synoviocytes. Polymyxin B-treated cells (2 × 104/well) were incubated for 72 hours in the presence of human TNF-like weak inducer of apoptosis (hTWEAK) at the indicated doses. Supernatants from dermal fibroblasts or synoviocytes were tested by ELISA for the different products. Values are shown as mean ± SEM. Except for PGE2, Mann–Whitney P values at 50 ng/ml and at 100 ng/ml versus control were significant (P < 0.02). In the presence of TNF or IL-1β, hTWEAK enhanced two to four-fold the production of PGE2, MMP-1 and IL-8 (Fig. 2). Similar results, but less marked, were observed with synoviocytes (data not shown). 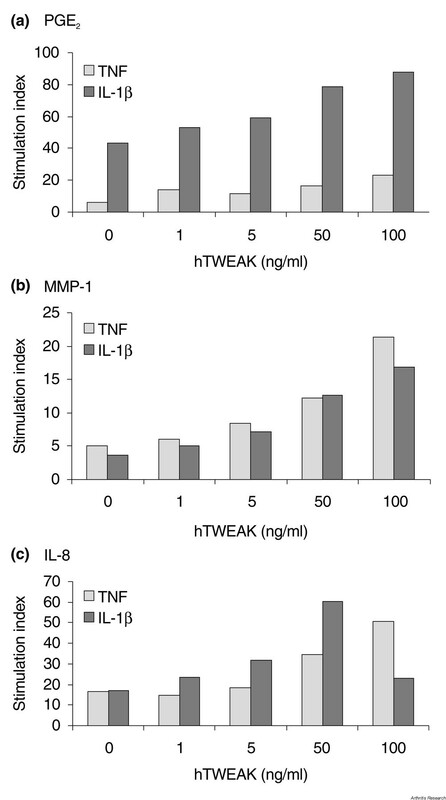 Stimulation indices of dose-dependent induction of (a) prostaglandin E2 (PGE2), (b) matrix metalloproteinase-1(MMP-1) and (c) IL-8 by human TNF-like weak inducer of apoptosis (hTWEAK) in combination with tumour necrosis factor (TNF) or IL-1β in dermal fibroblasts. Cells were incubated for 72 hours in the presence of hTWEAK at the indicated doses, together with TNF (1 ng/ml) or IL-1β (0.1 ng/ml). Supernatants were analyzed by ELISA for the different products. Stimulation indices represent TNF plus hTWEAK over control medium (in grey); IL-1β plus hTWEAK over control medium (in black). Similar results were obtained in nine independent experiments on dermal fibroblasts (P < 0.07 for 50 ng/ml hTWEAK compared to control). We further analyzed the secretion of proinflammatory molecules by dermal fibroblasts and synoviocytes by evaluating the levels of the chemokines RANTES and IP-10 after stimulation by TWEAK or TNF-α. We observed that these chemokines were much more strongly induced on dermal fibroblasts (Tables 1 and 2) and synoviocytes (Table 3) that had been stimulated by TWEAK than in the presence of TNF-α; the stimulation index for RANTES and IP-10 being 25 in TWEAK-cultured dermal fibroblasts but only 2.5 and 4 in TNF-cultured dermal fibroblasts. In synoviocytes, TWEAK induced RANTES 256-fold and IP-10 19-fold (compared to TNF-α which induced RANTES 17-fold and IP-10 6-fold). * Stimulationindices were calculated from the values obtained with the BEB3 anti-TWEAK mAb results: TWEAK/medium; (TNF + TWEAK)/TNF alone; (IL-1β + TWEAK)/IL-1β alone. Similar results were obtained in 3 independent experiments. hTWEAK, human TNF-like weak inducer of apoptosis; IP-10, interferon-γ-inducible protein-10; MMP-1, matrix metalloproteinase-1; nd, not detectable; PGE2, prostaglandin E2; RANTES, regulated on activation, normal T expressed and secreted; TNF, tumour necrosis factor. 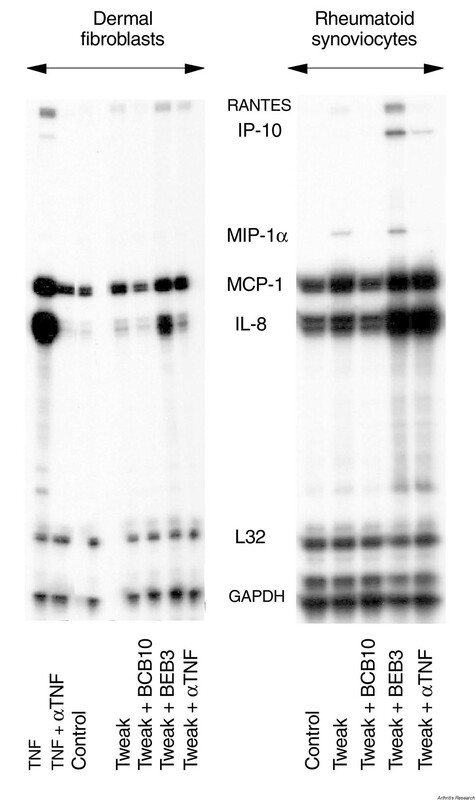 Values for IL-8, matrix metalloproteinase-1 (MMP-1), prostaglandin E2 (PGE-2) and interferon-γ-inducible protein-10 (IP-10) are shown as mean ± SD; similar results were obtained in 3 independent experiments. Single analyses for RANTES (regulated on activation, normal T expressed and secreted) were done because the amount of available medium was limited. hTWEAK, human TNF-like weak inducer of apoptosis; nd, not done; TNF, tumour necrosis factor. hTWEAK (TNF-like weak inducer of apoptosis) concentration was 10 ng/ml; TNF (tumour necrosis factor) concentration was 1 ng/ml. Values for IL-8, matrix metalloproteinase-1 (MMP-1), prostaglandin E2 (PGE-2) and interferon-γ-inducible protein-10 (IP-10) are shown as mean ± SD; similar results were obtained in 3 independent experiments. Single analyses for RANTES (regulated on activation, normal T expressed and secreted) were done because the amount of available medium was limited. nd, not done. The hamster anti-hTWEAK mAbs, BCB10 and BEB3, were tested for their effects on hTWEAK stimulation of IL-8, MMP-1, PGE2, IL-6, IP-10 and RANTES production by dermal fibroblasts. A representative result (out of 3 similar ones) is shown in Table 1. BCB10, a mAb that inhibits the binding of TWEAK-flag to HT29 cells, totally blocked the effects of hTWEAK in all the conditions tested. In contrast, BEB3 in association with hTWEAK markedly stimulated the production of IL-8 and IL-6 (18-fold), PGE2 (3.1-fold), MMP-1 (6.7-fold), IP-10 (34-fold) and RANTES (29-fold). The intrinsic effects of TNF and IL-1β were not blocked or increased by BCB10 and BEB3, respectively, indicating that the potentiating effects of hTWEAK on TNF and IL-1β stimulation were specific. The synergistic effects of TNF together with TWEAK, as well as IL-1 together with TWEAK, were dramatic. Indeed, TNF together with TWEAK increased the production of IP-10 69-fold and that of RANTES 46-fold, while IL-1 together with TWEAK enhanced RANTES production 35-fold. BEB3 alone had no effect on the different secretions, ruling out contamination. The use of a blocking mAb to TNF showed that TNF is not involved in the TWEAK-induced production of IL-8, MMP-1, PGE2, RANTES and IP-10 in dermal fibroblasts (Table 2) and in synoviocytes (Table 3). These experiments also revealed that although BEB3 alone had no effect on control dermal fibroblasts, it induced an increase in IL-8, MMP-1 and PGE2 secretions with control synoviocytes. The anti-TWEAK mAb, BCB10, blocked significantly the basal secretion of IL-8 and MMP-1. These results, and those obtained with BEB3, suggest that TWEAK was endogenous in synoviocyte supernatants. Dermal fibroblasts and synoviocytes were incubated for 16 hours with hTWEAK, either alone or in association with the different mAbs. Figure 3 shows that hTWEAK induced the mRNAs for RANTES, IL-8 and MCP-1 in dermal fibroblasts. These increases were completely blocked by BCB10. MMP-1 mRNA (not shown) and the chemokine mRNAs were further stimulated by BEB3, whereas anti-TNF mAb did not affect the stimulation by hTWEAK. Similar results were observed in synoviocytes for IL-8, MCP-1 and RANTES. Of interest, on synoviocytes, in contrast to dermal fibroblasts, hTWEAK was able to increase macrophage inflammatory protein (MIP)-1α and IP-10 mRNAs. In all the synoviocyte experiments, hTWEAK differed markedly from TNF in the chemokine profile induction since TNF failed consistently to stimulate the expression of RANTES, IP-10 and MIP-1α mRNAs (Fig. 3). RNAse protection assay on dermal fibroblasts and synoviocytes stimulated by human TNF-like weak inducer of apoptosis (hTWEAK) or tumour necrosis factor (TNF) in the presence of anti-TWEAK or anti-TNF mAbs. Polymyxin B-treated cells were cultured for 16 hours in the presence of 50 ng/ml TWEAK or 10 ng/ml TNF alone or in association with 10-7 M of the anti-TWEAK mAbs BCB10 or BEB3 (10 μg/ml) or anti-TNF mAb (10-7 M). Total RNA was extracted and tested by RNAse protection assay. Similar results were obtained in four independent experiments on dermal fibroblasts and two experiments on synoviocytes. GAPDH, glyceraldehyde-3 phosphate dehydrogenase; IP-10, interferon-γ-inducible protein-10; L32, housekeeping gene present in hcK5 template from Pharmingen; MCP, macrophage chemoattractant protein, MIP-1α, macrophage inflammatory protein-1α; RANTES, regulated on activation, normal T expressed and secreted. Cultures of human dermal fibroblasts and synoviocytes have proved relevant to in vitro models for studying surrogate markers of the mechanisms of chronic inflammatory diseases resulting in inflammation and tissue destruction of the joint structures. Synoviocytes are exquisitely sensitive to mediators of inflammation, such as TNF and IL-1β, and react strongly to direct contact with inflammatory T cells [1,2,3,4,5,6,35]. They are able to secrete numerous proinflammatory molecules, such as PGE2, chemokines (i.e. IL-8 and MCP-1) and proteolytic enzymes involved in extracellular matrix destruction such as MMP-1. The home-ostasis of inflammatory cytokines and metalloproteinases, as well as their respective inhibitors (i.e. IL-1Ra, TNFsR, tissue inhibitor of metalloproteinases-1) controls the process of tissue destruction [3,14,15]. In addition, the process of repair of collagen and proteoglycan is also inhibited by IL-1 and TNF [32,35]. We recently reported that a member of the TNF family, TWEAK, has inflammatory and cytotoxic activities like TNF and lymphotoxin (LT)α . Marsters et al. have reported that the receptor for TWEAK is the death-domain-containing receptor Apo3/DR-3/TRAMP, whereas Schneider et al. demonstrated that TWEAK-induced cell death occurs via TNF and TNF receptor I on the Kym-1 cell line. Nakayama et al. and Kaptein et al. showed that TWEAK binding and TWEAK-induced cell death occurs in a number of tumour cells deficient in Apo3/DR-3/TRAMP. There must exist a TWEAK receptor that does not contain a death domain because TWEAK also promotes the growth of endothelial cells . In addition, in astrocytes, which proved resistant to TWEAK-induced cell death, the binding of TWEAK results in the increased secretion of IL-8, IL-6 and intercellular adhesion molecule . The present study demonstrates another noncytotoxic effect of TWEAK in that hTWEAK stimulated dermal fibroblasts and synoviocytes to produce significant amounts of RANTES, IP-10, IL-8 and MMP-1 as well as some PGE2 and IL-6. Although hTWEAK has proinflammatory properties, these are much less pronounced than those of IL-1β and TNF (with the exception for RANTES and IP-10), even though it potentiates the proinflammatory activities of TNF or IL-1β. In contrast with TNF, induction by TWEAK of most of the inflammatory mediators requires a longer time of incubation. Consequently, it cannot be ruled out that the prolonged effect of TWEAK in stimulating these mediators may be due to the rapid induction of one or more intermediate mediators, which are unidentified to date. The production of PGE2, MMP-1, IL-8, IL-6, RANTES and IP-10 induced by hTWEAK (but not the production induced by TNF and IL-1β) was completely blocked by the mAb to hTWEAK, BCB10, confirming the specificity of hTWEAK. Moreover, blocking anti-TNF antibodies were inactive in the secretion of IL-8, MMP-1, PGE2, RANTES and IP-10 induced by TWEAK, ruling out any involvement of TNF in TWEAK activity. In contrast, BEB3, another mAb to hTWEAK, increased the activity of hTWEAK significantly, possibly by promoting the trimerization and/or stability of TWEAK. Such a mechanism has been observed with a number of ligands of the TNF family. On synoviocytes, but not on dermal fibroblasts, BEB3 alone stimulated the secretion of IL-8, MMP-1 and PGE2, whereas the blocking mAb to TWEAK, BCB10, reduced the basal level of IL-8 and MMP-1, suggesting that synoviocytes secrete endogenous TWEAK. The latency of this activity – observed on synoviocytes whether stimulated with BEB3 alone or not – could indicate that a soluble TWEAK inhibitor may also be secreted by these cells. In dermal fibroblasts, BEB3-crosslinked hTWEAK was shown to increase the mRNA level of three chemokines of the CXC or CC families, IL-8, MCP-1 and RANTES. In synoviocytes, BEB3-crosslinked hTWEAK increased the mRNA level of IL-8, MCP-1, RANTES, IP-10 and MIP-1α. The delayed synthesis of these molecules, contrasting with TNF-induced stimulation, suggests that TWEAK could be relevant to the persistence of the inflammatory response by recruiting neutrophils and macrophages to the site of the inflammation. TWEAK may be considered an additional player in the pathogenesis of chronic immunoinflammatory diseases leading to tissue destruction. Despite the clearly positive clinical results, obtained mainly with anti-TNF but to some extent also with anti-IL-1 therapy [17,18], as many as 20% of patients do not respond, while in others the destructive process persists. It is therefore very likely that other proinflammatory and prodestructive cytokines such as TWEAK may play an additional or synergistic role in destructive, chronic inflammatory diseases. We thank Yen-Ming-Hsu for purification of the yeast recombinant TWEAK ligand. This work was funded in part by the Swiss National Science Foundation, grant number 31-50930.97 (J-M Dayer).